The day had been incredibly long, each student had pushed their quirks to the max and the night had ended with a test of courage. As much as Mitsuko refused to admit it, it had actually been quite scary! Not in the traditional facing danger sense, but having someone jump out at you was its own fresh hell. Mitsuko didn't really like surprises. Though, at the very end, Kasumi had been there to "frighten her" by jumping on her back and clinging to her like a child. "BOO!" The other student laughed; Mitsuko, who had already been frightened several times, hardly reacted. She only grabbed hold of her friend's legs to keep her secure. "Aahhh-" Mitsuko 'screamed', her voice monotone. Kasumi giggled and rested her head on Mitsuko's shoulder. "Awwww, I knew I should have been at the front! I haven't scared anyone; they're all used to it by the time they get to me." She pouted then, sniffling. "Perhaps it has something to do with the fact that you're the least frightening here." Mitsuko suggested, walking forward, carrying the other on her back. Kasumi hummed as though she was thoroughly considering it, then grinned. "Maybe, do you think you'll scare me?" "I'll try." Mitsuko's expression was suddenly very determined. Most of the other students were quite a bit ahead of them and they walked in silence for a little while, but neither of them really minded. It was a nice break of pace for them to just be alone for a little while, and besides, the quiet gave them a little time to ponder over everything they'd done within the last two days. As they were walking, a fog wafted over the land, creeping towards them. "Mist?" Mitsuko inquired, but Kasumi immediately shook her head. "Definitely not, I have no control over it. It's... some kind of smoke.."
The effects were immediate; the lightheadedness accompanied by sudden drowsiness threw Mitsuko into action. Her quirk activated and muddy, unsaturated colors of light swirled all around them, cutting off the poisoned air in a dome like structure. As her arms were suddenly no longer holding her up and feeling too sleepy to hold on, Kasumi slipped off Mitsuko's back and stumbled backwards, using the barrier to catch herself. It felt cooler than it usually did; it normally felt like sitting in direct sunlight, so warm..
"It's poison," She ignored Kasumi's concerns. "We have to get away from this stuff quick, we have a very limited supply of oxygen." She motioned for Kasumi to follow, and she did. 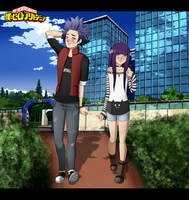 They were walking across the light produced by Mitsuko's quirk, it was very strange, actually. "Do you think this is part of the exercise?" Kasumi asked as she linked arms with Mitsuko, peering up at her as she shook her head. "I.." she hesitated. "I don't know, I have a bad feeling about this." Kasumi was glad that she had said so, because it was almost impossible to tell what her friend was thinking when she had her quirk activated. Just as the air was getting kind of thin, they reached an area that had none of the poison. It was almost instantaneous, the light "popped" from around them, dispersing in a way that reminded Kasumi of a firework, and Mitsuko gasped in relief; she would have fallen over if Kasumi hadn't been holding her up. "Are you okay!?" Kasumi cried, watching Mitsuko struggle to her feet, nodding. "I'm fine," she insisted. "I'm just a little tired is all." Kasumi frowned sternly. "That's about enough of that, you're not using your powers until we can get you some sun." Mitsuko would have argued, but a voice suddenly intruded both of their minds. "Everyone!" The voice started. "We're under attack by two villains! There might be more out there!" "Villains!?" Kasumi repeated, her dark blue eyes wide. "All those who can should get back to camp at once! If you encounter an enemy, don't engage! Just retreat!" Mitsuko's olive green eyes narrowed; why would she tell them not to fight? Heroes didn't run away, heroes fought no matter what, even if they were in a weakened state. However... her attention turned to Kasumi; it was clear to her that she was afraid, and looking at her brought Mitsuko to the realization that she, too was afraid. Even more so, realizing that Kasumi was in danger. No- she wouldn't let anything happen to her. "Running away?" The two girls spun around on their heels to face the unfamiliar voice. A man stood before them, green scales shimmering in the moonlight. He was grinning madly- or, perhaps that was just what if face looked like. He was a lizard, after all. "Typical, you'll grow up to be just like your coward heroes!" Mitsuko's hand flew in front of her friend as she stepped forward. "Stay back, Kasumi." she warned. "Aaaahh, once you're called out you'll feign bravery, now that's unsurprising. A brand new generation of fake heroes for us to mow down!" His large sword glinted in the pale light, and Mitsuko's expression grew grim. She understood why he looked familiar; the style of his clothing reminded her of the villain her classmates had fought before, Stain. This guy must have been some kind of copy-cat. "You think you're so much better than what you call fake heroes?" Mitsuko retorted, gritting her teeth. "Attacking children is a pretty cowardly move if you ask me." His smile fell immediately. Huh, so it wasn't just his face. "You watch your tongue!" He shouted, pointing one clawed finger at her. "Stain's ideals are perfect! AAAARG!" He lifted his sword, preparing to swing it with all his might. Her quirk activating, Mitsuko grabbed Kasumi under her arms and flew backwards to dodge the attack. Hope you enjoyed! Sorry if the writing is a little cringe, this is the first time I've really written anything for BNHA at length! Any resemblance to original characters of other works by other creators is completely coincidental. Boku No Hero Academia is owned by its creator(s), but the character and design of Mitsuko is mine, and Kasumi is Emei's! The artwork is mine, so please do not post elsewhere without my permission. Do not trace, reproduce, or steal in any shape or form. If you want something drawn for you, my commissions are open! There really is no reason to steal! HER REACTION TO BEING SCARED OMG MITSUKOS A SWEETIE!! MITSUKO IS THE CUTEST BEAN! A MAJOR FAV!!!! HHECK YEA THEIR FRIENDS WOULD COME TO SAVE THE BEST GIRLS!! !